New Years Resolutions are always the same and they always revolve around becoming a more healthy, positive person in the coming year. I used to work for a health club and it’s true that January is harvest time for gyms and health providers. It’s the month where everyone gives up alcohol in an attempt to kick start their new lifestyle and though we love the fundraising element of initiatives like Dry January ( and always make sure we have loads of non alcoholic cocktails on the menu) we wanted to look at things a little differently this year. What if, in reality, you realised you weren’t that unhealthy in 2016. Actually you did ok and infact…there are many reasons why alcoholic drinks (in moderation of course) are good for you. According to some researchers moderate alcohol consumption is good for the heart because of how alcohol interacts with the cardiovascular system. They claim alcohol in moderation can reduce bad cholesterol, increase good cholesterol, lower blood pressure, and minimize damage to arteries and blood vessels. And there are many alcoholic drinks that many believe to have certain medicinal qualities. 1. Chartreuse– Del’s absolute favourite liqueur, this green herbal liquid is an effective digestif. Chartreuse has been made by Carthusian monks since 1737 following instructions set out in a manuscript nicknamed “the elixir of long life” The drink is composed of 130 herbs, flowers and plants that are macerated in alcohol and steeped for eight hours into a tonic. Chartreuse soon grew in popularity and was often used for enjoyment rather than as a medicine. Noticing this trend, the monks adapted the recipe in 1764 to make a milder drink now known as Green Chartreuse. Today, the elixir is still made by a pair of monks at La Grande Chartreuse following the ancient recipe. So considering it is actually a medicine or tonic or sorts it’s made our list. Excellent to drink straight or in a cocktail such as The Last Word. 2. Red Wine– It’s the one you all know about and have heard a thousand times but many people believe wine is good for the heart and other things besides. Hippocrates was fascinated by wine’s medicinal properties prescribed the drink as a cure for fevers, to ease convalescence, as an antiseptic and a digestive aid. Today, red wine continues to be lauded for its health benefits, with resveratrol, an antioxidant-rich compound found in red grape skins, thought to have all sorts of health benefits, from slowing the ageing process by promoting tissue firmness and protecting against heart disease, to slowing cancer growth. Definitely a list of reasons why you should occasionally include a glass with your meal. 3. Picon– French apéritif Amer Picon was created in 1837 by scholar and soldier Gaétan Picon, who devised the drink to aid his recovery after contracting malaria while stationed in Algeria. Having worked in a distillery before joining the army, Picon knew enough about spirit making to create his elixir by infusing alcohol with dried orange zest, gentian, quinine, sugar syrup and caramel, then distilling it. The potion proved so potent, he attributed it to his recovery and was asked to produce further batches for his fellow soldiers. Picon is used in some of our cocktails and you can see it on our shelves. We will never know how well it does aid recovery from illness but we do know that it’s completely delicious! 4. Angoustura and Peychauds Bitters – Used in almost all our cocktails, bitters are an essential ingredient and are a mixologists spice rack for drinks preparation. The two mentioned here are made to very old recipes and were thought to have medicinal qualities. Angostura Bitters was invented in the early 1820s by German-born Dr. Johann Siegert. Originally named “Dr. Siegert’s Aromatic Bitters”, the tonic was created to treat tropical stomach ailments in Venezuela where Siegert worked as a senior physician. Peychaud’s Bitters was created as a herbal aid in the 1830s by Creole apothecary Antoine Amédée Peychaud. The gentian-based bitters is used in a large number of classic cocktails and plays a vital role in the Sazerac. Now made by Buffalo Trace distillery, like Angostura Bitters, the recipe remains a secret. Hot toddies are celebrated for helping to cure colds in winter, bringing a healthy glow to chilled cheeks. Made with a shot of malt whisky, a teaspoon of honey, slice of lemon and hot water often added are ginger, nutmeg, cloves and cinnamon the name is thought to come from Tod’s well, a spring on Arthur’s seat in Edinburgh. “A hot toddy promotes salivation and mucus secretion, our first line of defence against bacteria and viruses,” professor Ron Eccles, director of the Common Cold Centre at the University of Cardiff, told The Guardian. The whisky also acts as a sedative allowing for a good night’s sleep. Our staff are experts at these cold curing drinks and we have our own version too, The Bury Blazer, be sure to give it a go if you’re feeling sniffly. And that’s just a few of many drinks that are believed to have medicinal qualities or health benefits. We are not doctors of course and would always advise moderation but just remember, sometimes our New Years resolutions should not all be about denying ourselves things or punishing ourselves. Often we aren’t doing as bad as we think we are and guaranteed everyone else is not doing as well as you think they are. Relaxation and happiness are the best tonics so give yourselves a break and don’t forget often the things you think are bad for you, might just be doing you good. 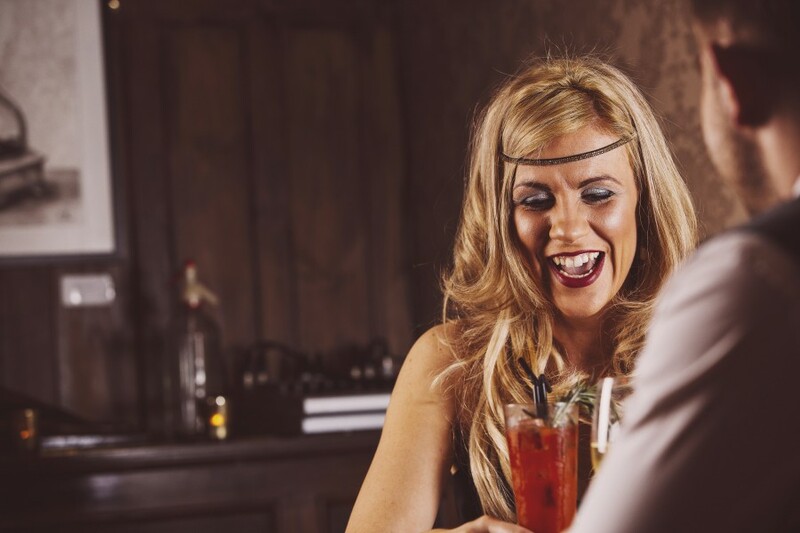 Enjoy your weekend cocktails in style, by booking a table at Riddles. Just pop in, or call us on (0161) 929 8053 to arrange your booking. On Fridays and Saturdays, there is a refundable deposit required of £25 per table (up to 8 people). Your deposit is refunded upon arrival - just ask us for more details. Get in touch now to arrange!